Questions about One Meal a Day? Get in touch. We got you. Looking for more information on how to try OMD? Trying to expand access to healthy foods on restaurant menus or in schools? Have a joke you’re dying to share? Reach out! We’re all ears and want to hear your stories, support you when you stumble and be your ally in your journey to make change. Join the movement! 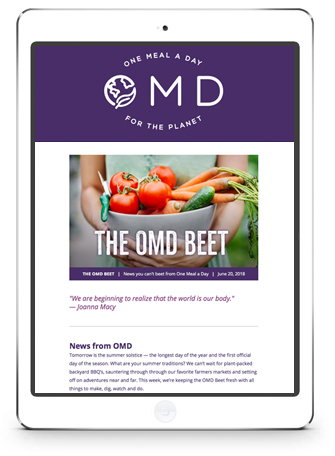 Sign up for our newsletter, The OMD Beet, for plant-based tips, book updates, news on our work to change school lunch programs and restaurants and much more. When you sign up, you’ll also get a free Starter Guide and invitation to our private Facebook group, OMD Insiders where you can ask questions and build community. We can all make a difference — one bite at a time! Yes! Sign me up for The OMD Beet.